Edoardo Torres – Guerrero, Claudia Jessica Espinoza – Hernández, Stephanie Arroyo – Camarena, Carlos Enrique Atoche – Diéguez. Tinea caused by Microsporum gypseum. Our Dermatol Online. 2018;9(4):380-385. Background: Tinea is a superficial mycoses caused by pathogenic, keratin digesting fungi, called dermatophytes. In Mexico, the most frequent agent is Trichophyton rubrum, and on the other hand, Microsporum gypseum is the most important geophilic one, however this is infrequent. Objective: To determinate the frequency and prevalence of M. gypseum infections in a Dermatological Center of Mexico. Methods: Descriptive, retrospective, observational and transversal study of a 14 years (2002 – 2016) period. All the patient charts with tinea due to M. gypseum confirmed by culture were included. The following data were analyzed: gender, age, occupation, provenance, time of onset and clinical features. Descriptive statistics were used. Results: A total of 3,921 mycological studies were done with 64 isolations of M. gypseum (1.7% of the total). 21.88% were students and 20.32% were mature adults. The body regions involved were head/neck (34.3%), trunk (21.8%), forearms (15.6%) and thighs (10.9%). Study Limitations: Some limitations of our work were the study period and the number of negative cultures from the total performed at our micology laboratory. Conclusions: Microsporum gypseum has a wide world distribution however clinical cases due to this agent are scarce. This is one of the largest compilations of clinical cases due to this pathogen. Students and housewives were the main affected. It could be due to play on the ground, contact with pets, or domestic duties. Tinea (ringworm or dermatophytosis) are superficial mycoses caused by pathogenic, keratin digesting fungi, called dermatophytes; these belong to four genera: Trichophyton, Microsporum, Epidermophyton and Chrysosporium. They infect skin, nails and hair; which may occasionally invade deeper tissues [1,2]. Dermatophytosis can be classified as superficial (tinea capitis, tinea corporis, tinea cruris, tinea manuum, tinea pedis, onychomycosis and tinea imbricata), and deep infections (tinea barbae, kerion celsi, favus, trichophytic granuloma, dermatophytic mycetoma and dermatophytic disease [Hadida]). The severity and course of the infection depends on the causative agent and the host immune response . This is a worldwide disease, but it predominates in tropical countries and it can be seen in different socioeconomic levels. Based on the transmission mechanism, the different causative agents can be acquired from the environment (geophilic dermatophytes), from infected animals like cats, dogs, rodents and cattle, among others (zoophilic dermatophytes) or from infected people (anthropophilic fungi) [2,3]. In Mexico, the most frequent agent is Trichophyton rubrum, an anthropophilic dermatophyte, and on the other hand, Microsporum gypseum is the most important geophilic one, however this last is an infrequently isolated agent . To determinate the frequency and prevalence of M. gypseum infections in a Dermatological Center of Mexico (Centro Dermatológico de Yucatán [CDY]. Dr. “Fernando Latapí”). Descriptive, retrospective, observational and transversal study of 14 years (2002 – 2016) performed at the Dermatological Center in Yucatan, Mexico. All the patient charts with tinea due to M. gypseum confirmed by culture were included. The following data were analyzed: gender, age, occupation, provenance, time of onset and clinical features. Descriptive statistics were used. 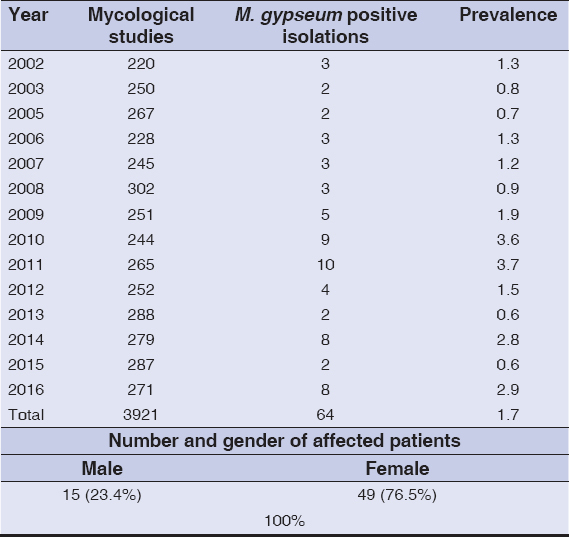 In the period mentioned above, a total of 3,921 mycological studies were done with 64 isolations of M. gypseum (76.5% corresponding to female patients), which represents 1.7% of the total of cases, with a higher prevalence in 2011 (Table 1). The average age of the affected patients was 16 years old (range 8 – 46 years) and the mainly affected group was school-age children (6 to 11 years old) followed by mature adults (35 to 59 years old). The majority of the patients were students followed by housewives. The results are shown at tables 2 and 3. Thirteen cases (20.3%) were acute (< 15 days), 22 (33,3%) subacute (16 to 30 days) and 29 (45.3%) chronic (> 30 days) with an average evolution time of 21 days. The main body regions involved were head and neck (Fig. 1) (34.3%), trunk (21.8%), forearms (Fig. 2) (15.6%) and thighs (10.9%). The results are presented in table 4. Figure 1: Tinea capitis (Kerion Celsi). 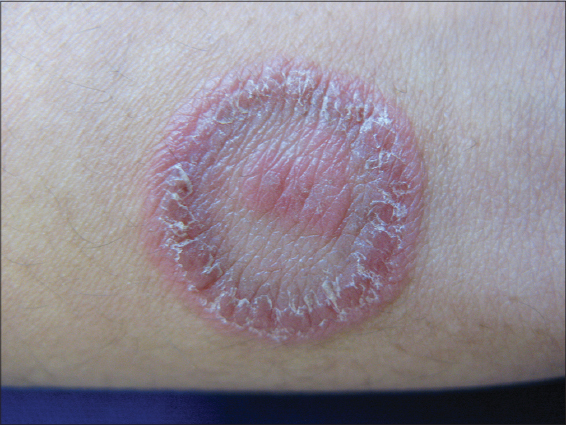 Figure 2: Tinea corporis due to M. gypseum. Thirty-seven patients (57.82%) were from Merida; two patients from each other populations (Tekax, Kanasín and Muna) were reported (3.15% in each case); several individual cases were from other municipalities of the State, and finally two patients were from neighboring entities (Fig. 3). 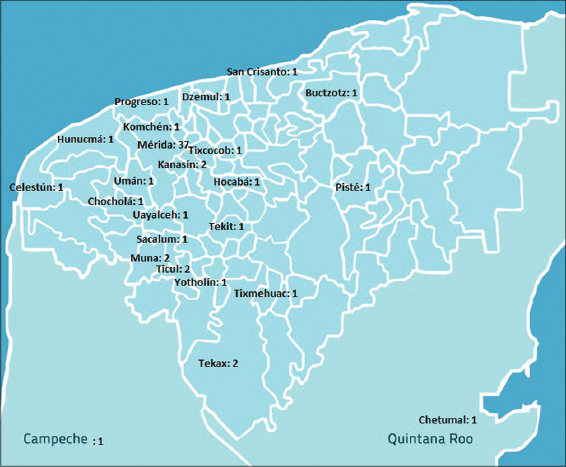 Figure 3: Yucatan State map and number of cases in each municipality. Tineas are mainly caused by antrophophilic or zoophilic dermatophytes worldwide, such as T. rubrum and M. canis, however, geophilic fungi have a more extended geographic distribution such as Microsporum gypseum  which is the most important soil acquired pathogen but clinical cases due to this agent are scarce. This causative agent can affect cats, dogs, rodents and horses, and in humans, in some cases, it can cause tinea corporis, tinea capitis and tinea faciei . This has been demonstrated by some epidemiological and environmental studies such as the conducted by Kachuei et. al in Iran, who reported a frequency of M. gypseum of 12.4% from soil samples in a collecting from 16 townships of Isfahan province ; and it was isolated in 1.1% of 15,684 samples of dogs and cats in Italy by Nardoni et. al. .
Worldwide, this pathogen has been reported in several series and case reports, but it has been infrequent. In our study, we collected 64 cases in a period of 14 years, corresponding to 1.7% from a total of 3921 mycological studies. In Greece, Maraki et. al isolated this fungus in 1.5% of the cases of 2674 samples from 2004 to 2010 . In Brazil, Heidrich and colleagues  obtained 14,214 positive cultures from 36,446 cases of dermatophytosis in 16 years, isolating M. gypseum in 122 cases (1.35%). This data is proportionally similar to our findings, but higher than 0.47% of frequency reported by Zida et. al. in Burkina Faso , similar to 0.1% and 0.33% reported by Rezaej-Matehkolaej and Bassiri-Jahromi, respectively, in Iran [11,12] from a total of 4120 clinical samples, and similar to data reported by Sei in Japan where only three cases from a total of 36,052 samples of outpatiens were caused by M. gypseum . Moreover, in an epidemiological study conducted by Pérez-González in Spain over a two-year period, this causative agent was isolated only in one case of tinea pedis . This result is similar to the obtained in a previous epidemiological study conducted by García et. al in Guadalajara, Mexico, with 2227 samples from children with lesions suspicious for tinea, where M. gypseum was found in 1% of the cases . On the other hand, some reports document a higher prevalence of this fungus such as Paudel and colleagues who published 8.33% of a total of 110 samples of suspected cases of dermatophytosis in Nepal  or the study conducted by Romano et. al in Sienna, Italy, with a frequency of 6.8% in a period from 2005 to 2006 . The predominance of females in our study was very marked respect to males (76.5% vs 23.4% respectively). This data is similar to Heidrich in Brazil with a male-female ratio of 1:4.64 in his study . Conversely, other studies conducted in Nepal, Iran and Japan reported a calculated male: female ratio of 1.39:1 [11,13,16], however, these numbers are from global results of these studies without a real proportion between genders of infected patients with M. gypseum. The most affected age groups were 11 to 19 years and 35 to 59 years. Those results are similar to those obtained by Heidrich et. al. who reported a predominance among young males and mature females in two age peaks with an average age of 7 years for male patients and an average age of 32.5 years for women; our patients were equally affected in the main infected group (scholar age) with seven boys and seven girls for a total of 14 patients with a 1:1 ratio; and an evident female predominance among the second most important group (12 females and one male patient) . In other studies, with general statistics of dermatophytosis, the results were different to ours. For example, Paudel in Nepal reported a predominance of general dermatophytosis among patients from 21 to 30 years; and Rezaej published a predominance in patients from 21 to 30 years and lower frequency in patients from 11 to 20 years old (opposite to our results, where the principal groups were 6 to 11 years old [14 patients], 35 to 59 years old [13 patients] and 12 to 19 years old [10 patients]) [11,16]. Respect to the frequency by occupation, students (39.1%) and housewives (23.4%) were the main activities (Table 3). It is partially concordant with the predominance of women among our patients, but it contrasts with the results obtained by Heidrich who reported a predominance of young males and mature women in his study. . The head was the most frequent topography, affecting 22 patients (34.3%) with an involvement of the face in eight individuals and scalp in seven patients (all those last patients with inflammatory tinea capitis); followed by upper limbs (23.5%) and the trunk (21.8%) (Table 4). The frequency of tinea corporis was 77.8% of the total. These results are very similar to the data obtained by Heidrich et. al. in Brazil where a predominance of the face was reported, with a frequency of 19.3% of the total, followed by the scalp with 11.7% and arms with 10%  and a frequency of tinea corporis of 46.2% of the total; a low propensity for the feet and toenails in both studies was found (opposite to the predilections for Trichophyton). Previous studies conducted in Mexico reported the isolation of M. gypseum in 2% from samples of patients with tinea capitis and tinea corporis but this percentage of tinea capitis and corporis was much lower than in our study (13 and 22% respectively), but with a similar predilection for patients between 3rd and 5th decades of the life for the last clinic form . In a previous epidemiological study conducted by Martínez et. al in Guatemala, M. gypseum was the most frequent etiological agent of tinea faciei . In other study conducted in Northeast Brazil, Silva-Rocha isolated M. gypseum from two samples of patients with tinea of glabrous skin and in one sample from toenail of a total of 113 positive cultures collected between 2013 and 2014 . On the other hand, Zida et. al, in a study conducted in Burkina Faso identified M. gypseum only in samples of two patients with tinea on upper and lower limbs ; and in Barcelona, Pérez-Gónzalez isolated M. gypseum only in one case of a scholar age patient with tinea pedis . Microsporum gypseum is a geophilic dermatophyte with a wide world distribution, however it is an infrequently isolated agent. It has been identified in epidemiological studies conducted by Bhagra in Brazil, in 71 cases over 30 years and in some microepidemics reported in Ivory Coast, England, Colombia and Brazil. Lavalle identified this fungus in Mexico in 41 cases from a total of 11,148 dermatophyte isolates over a period of 45 years [20–22]. In spite of its relative low frequency, M. gypseum is the most important geophilic dermatophyte, because it is a soil resident. This condition can predispose children who play on the ground or those who have contact with pets like cats and dogs or other domestic animals in which this dermatophyte has been isolated, usually as asymptomatic carriers without infection . This could explain the predilection of this causative agent to infect children and people who perform domestic duties (due to the high exposure of glabrous skin to the environment, associated with daily habits, life style and the high probability of trauma with contaminated items, with two age peaks such as those found in our study) , especially in suburban and rural environments where dirt floors are common. Moreover, it has been observed that inflammatory tinea capitis (Kerion Celsi) is more commonly caused by M. gypseum and M. canis (and less frequently by T. tonsurans). This can be explained because the enzymatic profile of M. gypseum is very similar to M. canis as evaluated in Barcelona by Bruguera et. al. using qualitative and semi-qualitative methods as API ZYM®, concluding that both fungi have almost the same enzymes (alkaline phosphatase, esterase, esterase lipase, lipase, leucine arylamidase, valine arylamidase, acid phosphatase, phosphoamidase, b – glucosidase, N – acetyl b glucosaminidase and a – mannosidase . These series compiles the epidemiological data of an infrequent but important pathogen fungus that is a relevant cause of inflammatory dermatophytoses such as Kerion Celsi, moreover this causative agent has been uncommon in previous studies conducted by other authors, but the climatic conditions of temperature and humidity of the Yucatan peninsula (the weather in 84.5% of its territory is hot and humid with a minimum temperature of 16° C, maximum of 36° C and average of 26° C)  seems to be appropriate to the development of these species; in addition, almost half of the patients were from rural areas of the Yucatan State (Fig. 1), which is one of the environmental characteristics of M. gypseum’s habitat, as we mentioned above. This work is one of the largest compilations of clinical cases of dermatophytoses due to this causative agent, which presents difficulties on its treatment when affect the scalp due to its capability to trigger a severe inflammatory immune response. So, mycological diagnosis is very important not only to determinate a therapeutic regimen for the patients, but also it can help to definite an approximate social – economic situation and life conditions of the people who suffer this disease, because it is important to emphasize that in Merida City, most of people lives in houses with gardens and ground backyards where frequently does gardening activities and it is probably that there are the biological niches of the causative agents. Some limitations of our work were the study period and the number of negative cultures from the total performed at our micology laboratory. 1. Torres – Guerrero E, Ramos – Betancourt L, Martínez – Herrera E, Arroyo – Camarena S, Porras C, Arenas R. Dermatophytic blefaritis due to Microsporum gypseum. An adult variety of tinea faciei with dermatophytoma. Our Dermatol Online. 2015;6: 36-38. 2. Arenas R. “Dermatophytosis” In: Arenas R, Estrada R. Tropical Dermatology, 1th Ed. Texas, Landes Bioscience 2001. Pp: 2 – 11. 3. Arenas R. Micología Médica Ilustrada, 5ta. Ed. México, McGraw Hill Companies 2014. Pp: 67 – 98. 4. Puri N, Puri A. A study of Tinea Capitis in the preeschool and school going children. Our Dermatol Online. 2013;4:157–60. 5. Narváez D, Di Martino Ortiz B, Rodríguez Masi M. Annular skin lesions in childhood: Review of the main differential diagnosis. Our Dermatol Online. 2017;8:75–80. 6. Kachuei R, Emami M, Naeimi B, Diba K. Isolation of keratinophilic fungi from soil in Isfahan province, Iran. J Mycol Med. 2012;22:8–13. 7. Nardoni S, Mugnaini L, Papini R, Fiaschi M, Mancianti F. Canine and feline dermatophytosis due to Microsporum gypseum: a retrospective study of clinical data and therapy outcome with griseofulvin. J Mycol Med. 2013;23: 164–7. 8. Maraki S, Epidemiology of dermatophytoses in Crete, Greece between 2004 and 2010. G Ital Dermatol Venereol. 2012;147:315–9. 9. Heidrich D, Rocha-García M, Ottonelli-Stopiglia CD, Massotti-Magagnin C, Daboit TC, Vetoratto G, et al. Dermatophytosis: a 16-year retrospective study in a metropolitan area in southern Brazil. J Infec Dev Ctries. 2015;9:865–71. 10. Zida A, Barro-Traoré F, Dera M, Bazié Z, Niamba P. Guiguemdé TR. Aspects épidémiologiques et étiologiques des mycoses cutanéo-phaneriennes chez les détenus de la maison d’arrêt et de correction de Ouagadougou (Burkina Faso). J Mycol Med. 2015;25:e73–9. 11. 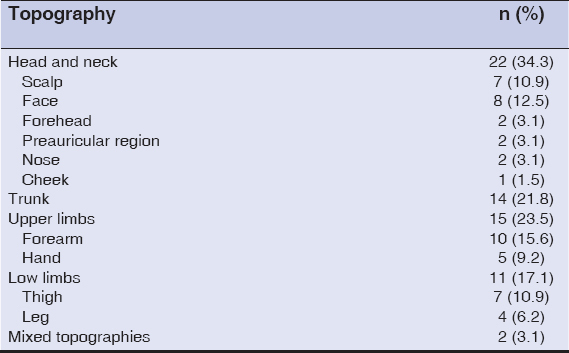 Rezaei-Matehkolaei A, Rafiei A, Makimura K, Gräser Y, Gharghani M, Sadeghi-Nejad B. Epidemiological Aspects of Dermatophytosis in Khuzestan, southwestern Iran, an Update. Mycopathologia. 2016;181:547–53. 12. Bassiri-Jahromi S. Epidemiological trends in zoophilic and geophilic fungi in Iran. Clin Exp Dermatol. 2013;38:13–9. 13. Sei Y. 2011 Epidemiological Survey of Dermatomycoses in Japan. Med Mycol J. 2015;56:J129–35. 14. Pérez-González M, Torres-Rodríguez JM, Martínez-Roig A, Segura S, Griera G, Triviño L, et al. Prevalence of tinea pedis, tinea unguium of toenails and tinea capitis in school children from Barcelona. Rev Iberoam Micol. 2009;26:228–32. 15. Arenas R. Dermatofitosis en México. Rev Iberoam Micol. 2002;19:63–7. 16. Paudel D, Manandhar S. Dermatophytic Infections among the Patients Attending Di Skin Hospital and Research Center at Maharajgunj Kathmandu. J Nepal Health Res Counc. 2015;13:226–32. 17. Romano C, Massai L, Gallo A, Fimiani M. Microsporum gypseum infection in the Siena area in 2005-2006. Mycoses. 2009;52:67–71. 18. Martínez E, Pérez-Cantillo M, Alas- Carbajal R, Rivas E, Escalante K, Valencia C, et al. Dermatofitoma extraungueal. Comunicación de 15 años. Dermatología Rev Mex. 2010;54:10–3. 19. Silva-Rocha WP, de Azevedo MF, Chaves GM. Epidemiology and fungal species distribution of superficial mycoses in northeast Brazil. J Mycol Med. 2017;27:57–64. 20. Zhang R, Ran Y, Dai Y, Zhang H, Lu Y. 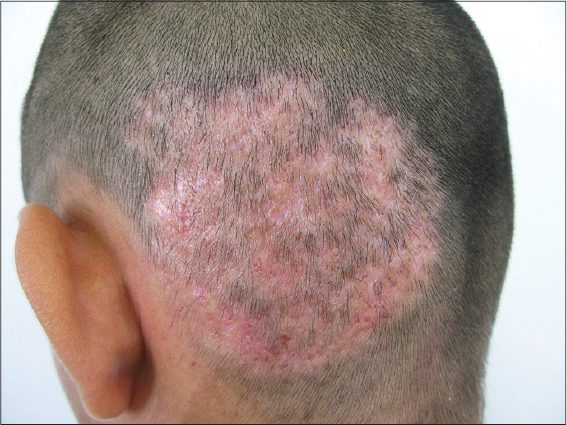 A case of kerion celsi caused by Microsporum gypseum in a boy following dermatoplasty for a scalp wound from a road accident. Med Mycol. 2011;49:90–3. 21. Lavalle P, Padilla-Desgarennes MC, Reynoso S. Microsporum gypseum. Su aislamiento del suelo y de dermatofitosis humanas. Las minitiñas de M. gypseum. Dermatología Rev Mex. 2002;46:101–7. 22. Bhagra S, Ganju SA, Sood A, Guleria RC, Kanga AK. Microsporum gypseum dermatophytosis in a patient with acquired immunodeficiency syndrome: A rare case report. Indian J Med Microbiol. 2013;31:295–8. 23. Bruguera MT, Abarca ML, Bragulat MR, Cabañes FJ. Determinación de actividades enzimáticas en cepas de Microsporum canis y Microsporum gypseum. Rev Iberoam Micol. 1997;14:119–24.